Could high-resolution images obtained without dilation open up new opportunities for early diagnosis? • Although scanning laser ophthalmoscopy has advantages over traditional fundus photography for retinal imaging, it does not capture true color information. • The Eidon confocal scanner obtains real color images with automated, dilation-free operation. For many retinal conditions, such as diabetic retinopathy (DR) and age-related macular degeneration (AMD), early diagnosis and treatment can help delay or prevent vision loss, slow progression of the disease, and alleviate symptoms.1-7 Diagnosis of these diseases generally begins with visual acuity tests and a dilated eye exam, but many elderly patients are taking tamsulosin or other pharmacologic agents that cause pupil constriction. Others may have had cataract surgery that resulted in anterior capsular opacification, allowing limited visibility of the retina. Scanning laser ophthalmoscopy is in many ways superior to conventional fundus photography—it works through smaller pupils using confocal imaging, and it provides better contrast—but it is unable to capture true color information. The Eidon confocal scanner (CenterVue) addresses this deficiency and offers several welcome benefits, which are reviewed in this article. The Eidon consists of a user-friendly software interface and its intuitive commands allow it to be used in fully automated or fully manual mode. Through the use of a high-resolution, multitouch, color display tablet, it operates as a standalone unit, with local storage of patient information and images. The device’s imaging and viewing features are described in more detail below. Whereas other confocal scanning systems such as the Spectral OCT/SLO device (Optos) use monochromatic lasers, the Eidon uses white light to provide true color imaging with three confocal imaging modalities: true color (obtained using white illumination), red-free (which can be used to enhance visibility of the retinal vasculature and retinal nerve fiber layer), and infrared (for choroid information). High-resolution 60° images can be captured even in undilated eyes and without optic bleaching. Because the device can obtain images through a pupil as small as 2.5 mm, it allows capture of excellent images in almost any patient. The white light illumination allows increased perception of retinal pathologies and affords an enhanced view of the optic nerve, providing images that are on par with what would be observed directly. These true color images are essential in determining an accurate diagnosis. Eidon is also capable of capturing multifield acquisitions, up to 110˚ automatically and 150˚ in manual mode. 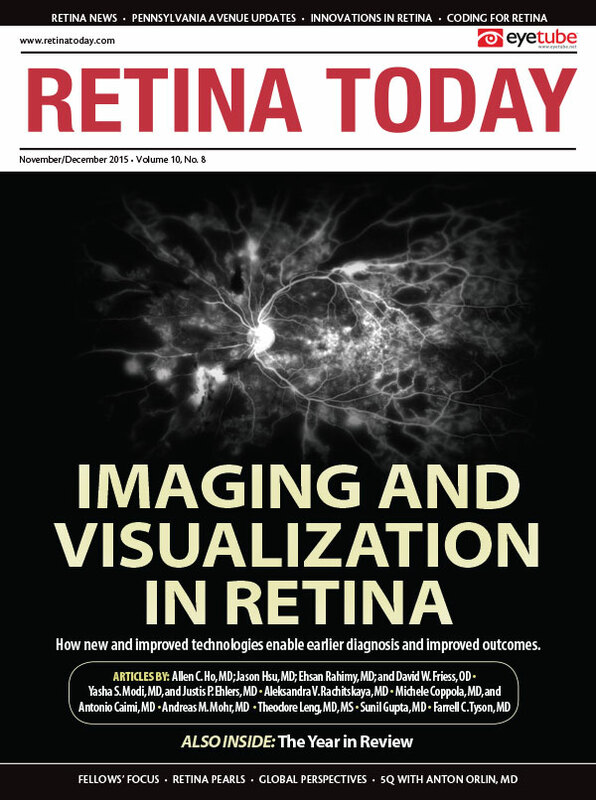 An option allows multiple images to be stitched together into mosaics to provide a widefield view that enables detection of pathology in the periphery of the retina (Figure). Figure. An example of a widefield mosaic view obtained with the Eidon confocal scanner. The Eidon can be used to document pathology including macular degeneration, epiretinal membranes, macular holes, and peripheral lesions. In our general clinic, it doubles as the camera we use to take disc photos for glaucoma. We also use it as a screening tool in the clinic to take images of all patients coming through the door, dilated or not, because screening requires a widefield view. The camera is capable of capturing images in approximately 3 minutes, and this has sped up our patient flow. 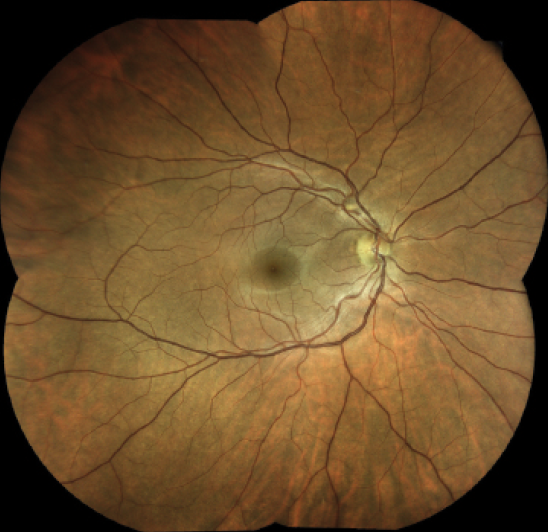 Some patients do not require fluorescein angiography but need a fundus photo to document pathology. In such cases, patients can have a fundus image taken with the Eidon platform, which is more staff- and time-efficient and helps cut the cost of staff overhead. Eidon’s touchscreen tablet interface is built to communicate with an office’s computer system so that images taken with the scanner can be accessed from any computer with an Internet connection. This is helpful in educating patients because one can bring up images on any Wi-Fi–capable tablet to better explain their pathology and what treatments will be necessary to combat the condition. The remote viewing function also makes this technology ideal for telemedicine applications, as primary care physicians in rural areas can upload captured information for a retina specialist to review, enabling early disease detection. Most cameras require operation by a highly skilled technician, but the Eidon will walk patients through the exam. It features automatic pupil alignment and retinal focusing, allowing any staff member to efficiently run tests. Specifically, it auto-aligns to a patient’s pupil; focuses the retina; and captures images, both infrared and color, using a soft light source to ensure patient comfort. If necessary, it is also possible to switch to manual mode and use a virtual joystick to focus and align with specific areas to capture particular pathologies in greater detail. Farrell C. Tyson, MD, is an ophthalmologist at Tyson Eye in Cape Coral, Fla., and a clinical investigator for numerous US Food and Drug Administration studies. He has no disclosures relevant to the content of this article. Dr. Tyson may be reached at tysonfc@hotmail.com. 1. Rauch R, Weingessel B, Maca SM, Vecsei-Marlovits PV. Time to first treatment: the significance of early treatment of exudative age-related macular degeneration. Retina. 2012;32(7):1260-1264. 2. Muether PS, Hoerster R, Hermann MM, et al. Long-term effects of ranibizumab treatment delay in neovascular age-related macular degeneration. Graefes Arch Clin Exp Ophthalmol. 2013;251(2):453-458. 3. Muether PS, Hermann MM, Koch K, Fauser S. Delay between medical indication to anti-VEGF treatment in age-related macular degeneration can result in a loss of visual acuity. Graefes Arch Clin Exp Ophthalmol. 2011;249(5):633-637. 4. Canan H, Sızmaz S, Altan-Yaycıoğlu R, et al. Visual outcome of intravitreal ranibizumab for exudative age-related macular degeneration: timing and prognosis. Clin Interv Aging. 2014;9: 141-145. 5. Oliver-Fernandez A, Bakal J, Segal S, et al. Progression of visual loss and time between initial assessment and treatment of wet age-related macular degeneration. Can J Ophthalmol. 2005;40(3):313-319. 6. Bresnick GH, Mukamel DB, Dickinson JC, Cole DR. A screening approach to the surveillance of patients with diabetes for the presence of vision-threatening retinopathy. Ophthalmology. 2000;107(1):19-24. 7. Kinyoun JL, Martin DC, Fujimoto WY, Leonetti DL. Ophthalmoscopy versus fundus photographs for detecting and grading diabetic retinopathy. Invest Ophthalmol Vis Sci. 1992;33(6):1888-1893. 8. Hibbs SP, Smith A, Chow LP, Downes SM. Colour photographs for screening in neovascular age-related macular degeneration: are they necessary? Eye (Lond). 2011;25(7): 918-921.